Time to go to the tea shop! You are in Home » Only in Myanmar » Time to go to the tea shop! Tea shop is one of the most favorable spot to gather and meet up. The tastes vary depending on tea master of the shop. From the most to the least degree of sweetness or bitterness, he makes tea with three main ingredients; milk, sugar and creamer. This is why “tea master” is key to a shop, just like the chef of restaurants. His formula of the combination and creativity can make his tea popular and draw consumers to the shop every day. 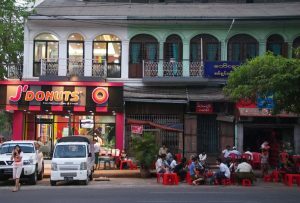 But tea shops not only serve milk tea, they also serve many other items in the menu such as စမူဆာ (Sa Mu Sar), အီၾကာေကြး (E Kyar Kway) and ပလာတာ (Pa lar Tar). These are snacks made of wheat that Burmese people usually have for their breakfast together with milk tea. This is why most of tea shops have their busiest time in the morning. The price of tea is cheap. Any kinds of La Phat Yay (လဖက္ရည္) normally costs about 200Ks (0.2 USD) and စမူဆာ (Sa Mu Sar) or အီၾကာေကြး (E Kyar Kway) are about 100Ks to 200Ks depending on their size. 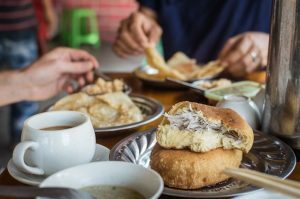 Don’t be surprised if the waiter brings you a side dish of စမူဆာ (Sa Mu Sar) or some traditional cakes without you ordering for it. Those are complimentary. 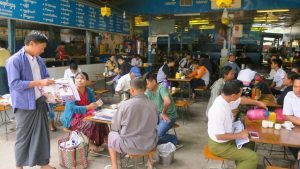 Now you know better what and how to order in a tea shop in Myanmar. Feel relaxed and sit comfortably at the shop. Simply say ‘Give me one cup of Paw Saing (ေပါ့ဆိမ့္)’ to the waiter. Try it together with စမူဆာ (Sa Mu Sar). That’s my favorite option I recommend.